A Liquid Crystal Display (LCD) can be of the character type or graphics type. 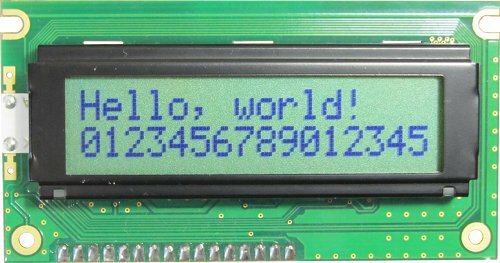 Graphic LCD displays have a matrix of pixels that can be used to display text and graphics, e.g. 128 by 64 pixel display. When starting electronics, a character LCD will usually be used. Character LCDs can display characters only and are divided into rows of characters. 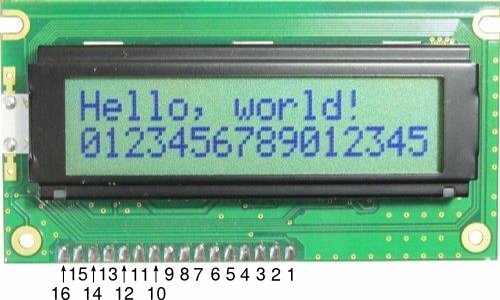 For example a 2 by 16 character LCD display has two lines that can display 16 characters each. An example of a 2 × 16 character display is shown below. LCDs are available with or without a backlight. A backlight is just a light in the LCD that lights up the display making it easier to read in low light conditions. There are a number of character LCDs based on the Hitachi HD44780 LCD controller and driver IC. These displays are software compatible and available from several different manufacturers. There are even pin compatible character LCDs that are available from different manufacturers. Always check the datasheet from the manufacturer to make sure of the pin numbering and pin functions of the LCD display that you are going to use. It is possible that other displays are also compatible with this one. If a backlight is not present, then pin 1 and 2 may be missing. Other LCDs may have the pins at the top and pin numbering may start with 1 on the left.